The chances are good that if you’re reading this you already know about the health benefits of consuming fermented foods. 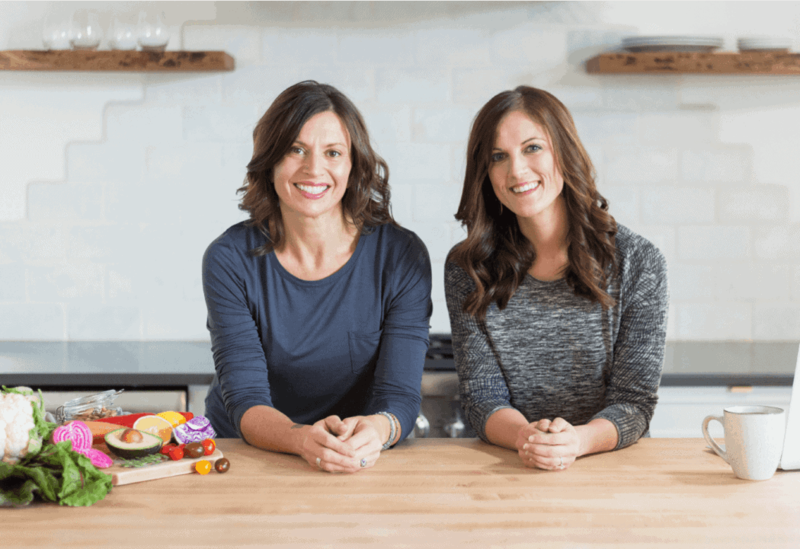 If not, then check out our 5 Reasons to Eat Fermented Foods Everyday post. Not only is sauerkraut good for your gut it’s good for your taste buds. It’s tangy-tart flavor is the perfect companion to grilled burgers, salads and more. Eating just a spoonful or two before a meal increases saliva production, decreases stomach pH and activates certain digestive enzymes so you digest your food better. It’s pretty much a miracle food around our house. Since adding a twice daily dose of sauerkraut or other fermented vegetables to his diet, my husband’s heartburn has completely disappeared. 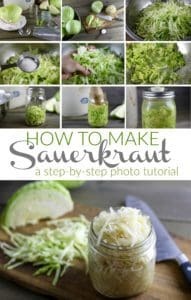 Not only is homemade sauerkraut healthy (packed with probiotics, enzymes and vitamins B and C) it’s also economical. 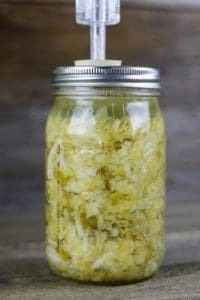 For a mere $4 (or less) you can make a jar of sauerkraut at home that would easily cost you $7-12 at the store or farmers market. And it doesn’t get any more local than using the cabbage from your own garden and fermenting it in your kitchen! I remember my first foray into fermenting. It was freaky. I had no idea if what I was doing was right and if whether or not my sauerkraut would be safe to eat. But lo and behold, it was just fine. I was all in a dither about nothing – once I got started and made several batches, it was easy. 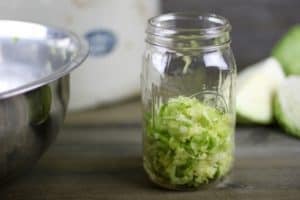 You may be feeling exactly the way I did with that first batch so that’s why I’m sharing my easy, fearless method for making sauerkraut using a quart mason jar and a simple lid so that you too can fear less and ferment more. 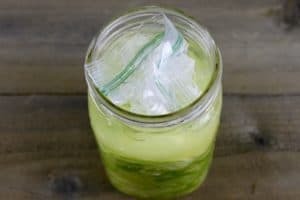 Sure you can really fancy when it comes to fermenting – there are loads of gadgets, lids, containers and such that you can use but you don’t have to. I’ve made sauerkraut in jars and crocks, with lids and without, with and without airlocks and using special weights or just a plastic freezer bag filled with water for a weight. And they’ve all turned out great. So if not having the ‘right equipment ‘ is holding you back, then I’m here to call you out on that one. You don’t have to be fancy, you just have to get started. You can always add some fancy crocks, weights and airlocks to your game as you get more adventurous in your fermenting forays. This is the method I teach in my “Learn to Ferment” workshops because it’s simple and it produces a small jar of kraut that ferments in 7-14 days, depending on the temperature of your home. Warmer temps mean faster ferments and cooler temps mean it’s going to take a little longer. Smaller quantities also ferment faster than larger batches. Basically, what I’m saying is that this is the perfect way to get started making your own sauerkraut. Seriously, if you’ve been thinking about making sauerkraut at home – this tutorial is for you. Rinse cabbage in cool water. Remove the coarse outer leaves and discard. Remove and rinse a few unblemished leaves and set them aside. Rinse the cabbage again in cool water and place on cutting board. 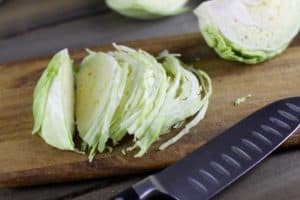 Using a large knife, quarter the cabbage and remove the core. 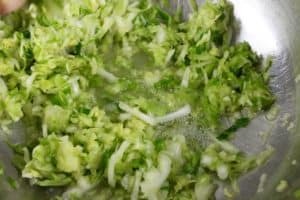 Thinly slice the cabbage with a knife or mandoline slicer then transfer cabbage to a large bowl. Slicing is better than shredding: A large knife, mandoline slicer or the slicing side of a box grater are tools of choice when making sauerkraut. Cut-resistant gloves are optional. The “core” — cut the cabbage once again into quarters and remove the core by cutting it out with a knife. Make the thin slices as uniform as possible so it will ferment evenly. Add 1 teaspoon of the salt and, with your hands, massage it into the cabbage. When the cabbage starts to look wet and shiny, taste it. You should be able to taste the salt without it being overwhelming (in other words it should be a little salty but still taste good). Add more salt, a little at a time, as needed to get that ‘salty but not too salty’ taste. 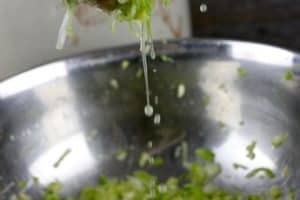 Continue to massage until the cabbage becomes wet and limp and liquid (aka brine) begins to pool in the bottom of the bowl. When you can squeeze the cabbage with two hands and the brine runs freely into the bowl, you’re ready for Step 4. If you’ve put in a good effort and don’t have much brine, cover the bowl and allow it to sit for 45 minutes. Massage again until the liquid runs freely when you squeeze a handful of cabbage in your hands. Sprinkle the salt evenly over the shredded cabbage. Get in there and massage it like you mean it. Kraut making is very stress relieving. After a few minutes of massaging, your cabbage will start to change color, soften slightly and become wet and shiny. Keep massaging until you see liquid (aka ‘brine’) pooling in the bottom of the bowl. It should run freely when you squeeze a large handful of cabbage. Cabbage in a pool of brine. 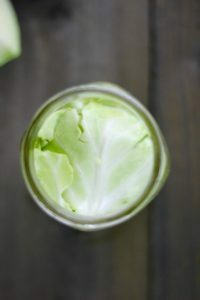 Transfer the cabbage to a clean 1 quart mason jar a few handfuls at a time, stopping to press the cabbage into the bottom of the jar using your hand to work out any air pockets before you add more cabbage. Repeat this adding and pressing until all of the cabbage has been packed tightly into the jar. You should have some brine on top of the cabbage once it’s all been pressed into the jar. Leave 2-3 inches of headspace in the jar so you have enough room for the next step. If you have too much cabbage, place some in another clean jar (yeah for extra kraut!) and follow the remaining steps for that jar too. 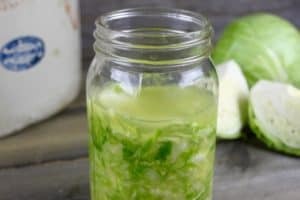 Use your hand or a ‘tamper’ to press the cabbage firmly into the bottom of the jar to remove any air bubbles that may cause your kraut to spoil. Top the packed cabbage with 1 or 2 of the reserved leaves, gently tucking them down along the sides to keep little bits of cabbage under the brine. 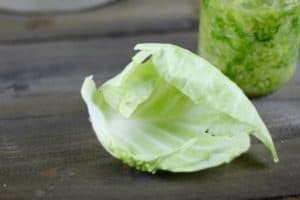 If you have bits of cabbage floating in the brine after placing the leaves over the top, pick them out to the best of your ability as anything not covered in brine (i.e. floating and exposed to air) increases your chances of developing mold. 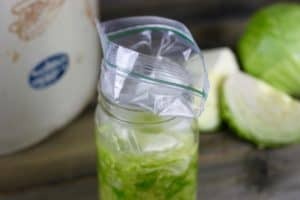 Place the zip-top freezer bag into the jar and use your fingers to spread it out so that it covers as much of the cabbage leaf as possible. Fill with cool filtered water and seal while pressing out as much of the air as possible. Tuck the top of the bag into the jar. If using a lid with an airlock, screw lid on tightly, fill airlock to ‘Fill’ line with water and snap airlock cap in place. 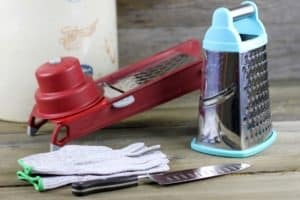 If not using an airlock, very loosely screw lid onto jar (so that gases created during fermentation can escape) or cover with a clean kitchen towel. 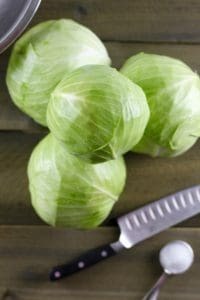 If you see air pockets or notice that the brine is not completely covering the cabbage, carefully remove the lid and zip-top bag and with clean hands, gently press the cabbage down to return everything to below the brine. Kraut at 24 hours. Notice the bubbles starting to form and the bright green color. 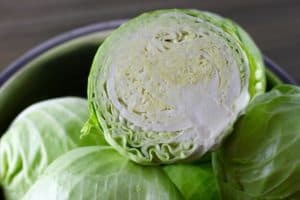 Be on the look out for air pockets and for your cabbage to move up above the brine as gases created by bacteria during fermentation in the first 2-5 days push the cabbage up. 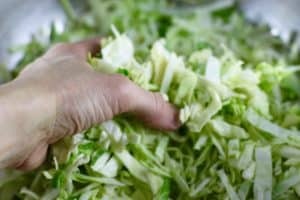 If your cabbage starts to creep up, use a clean hand to gently press is back down. *If you see scum or foam, it’s generally harmless so you can leave it since this is a relatively ‘short’ ferment. If you see white or bluish furry surface mold, scoop it out with a clean finger or a utensil before pressing everything below the brine again. Replace the bag with a clean water-filled bag and wash the lid before placing back on the jar. Taste test your kraut starting at Day 4 by carefully removing the bag with clean hands. Use a plastic or wooden fork to gently push the cabbage leaves aside and remove a small taste. 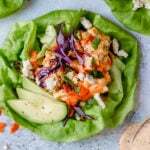 It’s ready when it has a pleasing pickle-y flavor without the strong acidity of vinegar, the cabbage has softened a bit but retains some crunch and the cabbage is more yellow than green and slightly translucent (like it’s been cooked). If it’s not ready, rinse the bag under running water and carefully place it back in the jar so that all of the cabbage is below the brine. Wait another day or two then taste again to see what you think. Sauerkraut at 5 days. Notice the color change and the air pockets – this jar needs to be pressed down it everything is below the brine! When it’s pleasing to your tastebuds (and/or less than a pH of 4.6 as measured with a pH strip), skim off any scum from the surface and transfer your finished kraut into clean glass jar, tamping it down with your clean hand, a tamper or the handle of a wooden spoon. Pour any leftover brine into the jar. Optionally, top with a small circle of parchment paper by lightly pressing it onto the surface. 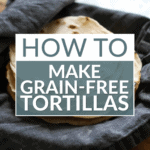 Tighten the lid then refrigerate for up to 6 months to 1 year. Now go forth and make some sauerkraut. Making your own healthy and delicious sauerkraut at home is easy and economical. 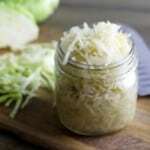 This is the perfect recipe for beginners and using a jar rather than a crock allows you to see the transformation from cabbage to kraut. Add 1 teaspoon of the salt and, with your hands, massage it into the cabbage. When the cabbage starts to look wet and shiny, taste it. You should be able to taste the salt without it being overwhelming (in other words it should be a little salty but still taste good). Add more salt, a little at a time, if needed to get that ‘salty but not too salty’ flavor and a good amount of brine. Continue to massage until the cabbage becomes wet and limp and brine begins to pool in the bottom of the bowl. When you can squeeze the cabbage with two hands and the brine runs freely into the bowl, you’re ready for Step 4. If you’ve put in a good effort and don’t have much brine, cover the bowl and allow it to sit for 45 minutes. Massage again until the liquid runs freely when you squeeze a handful of cabbage in your hands. 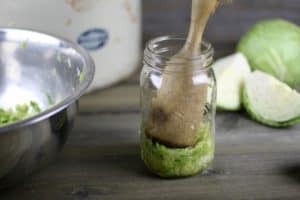 Transfer the cabbage to a clean 1 quart mason jar or crock a few handfuls at a time, stopping to press the cabbage into the bottom of the jar using your hand to work out any air pockets before you add more cabbage. Repeat this adding and pressing until all of the cabbage has been packed tightly into the jar. You should have some brine on top of the cabbage once it’s all been pressed into the jar. Leave 2-3 inches of headspace in the jar so you have enough room for the next step. If you have too much cabbage, place some in another clean jar (yeah for extra kraut!) to make a second batch. 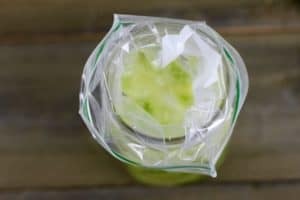 Place the zip-top freezer bag into the jar and use your fingers to spread it out so that it covers as much of the cabbage leaf as possible. Fill the bag with cool filtered water and seal it while pressing out as much of the air as possible. Tuck the top of the bag into the jar. If using a lid with an airlock, screw lid on tightly, fill airlock to ‘Fill’ line with water and snap airlock cap in place. If not using an airlock, very loosely screw lid onto jar (so that gases created during fermentation can escape) or cover with a clean kitchen towel. Taste test your kraut starting at Day 4 by carefully removing the bag with clean hands. Use a plastic or wooden fork to gently push the cabbage leaves aside and remove a small taste. 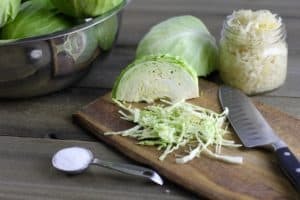 It’s ready when it has a pleasing pickle-y flavor without the strong acidity of vinegar, the cabbage has softened a bit but retains some crunch and the cabbage is more yellow than green and slightly translucent (like it’s been cooked). If it’s not ready, rinse the bag under running water and carefully place it back in the bag so that all of the cabbage is below the brine. Taste again in another day or two to see what you think. When it’s pleasing to your tastebuds (and/or less than a pH of 4.6 as measured with a pH strip), skim off any scum from the surface and transfer your finished kraut into clean glass jar, tamping it down with your clean hand, a tamper or handle of a wooden spoon. Pour any leftover brine into the jar. Optionally, top with a small circle of parchment paper by lightly pressing it onto the surface. Tighten the lid then refrigerate for up to 6 months to 1 year. Are you ready to make homemade sauerkraut? I’d love to hear what you thought of this tutorial – Leave your comments or questions below! I love that you prefaced the article / recipe by easing those who may be scared of fermentation in to the idea of it. It really is not as scary as some people think – and the end product is so good for you! What are the benefits of using an airlock or not using one? Does it change the taste / end product of the sauerkraut if you do or don’t? This is something I’ve been curious about for a while now, I have yet to use an airlock on my fermentation, but if it is going to benefit my product more there is a first time for everything! I learned to ferment (aka taught myself after reading ‘Wild Fermentation’ by Sandor Katz) without the use of an airlock. However, as I started teaching fermentation workshops the one thing I noticed from participants was their ‘fear’ of the process – fear of mold, fear of slime, fear of poisoning their loved ones… I found that the use of an airlock adds a sense of security for most new fermentistas. It can also give you more control in damp climates where native molds are abundant (like the Pacific Northwest) and may increase your risk of a spoiled batch. I’ve also found that living in Colorado, liquid in my ferments tends to evaporate much more quickly but an airlock tends to slow this – so I don’t have to worry about adding as much extra brine for big batches of kraut (5+ gallons) that may take 12-16 weeks to fully cure. Ultimately, using an airlock is a very personal choice. I use them about 50% of the time (usually for longer ferments like whole lemons/limes, big batches of kraut and of course, for beer or cider). I rarely use them for quick ferments like my Fermented Carrots with Dill though. 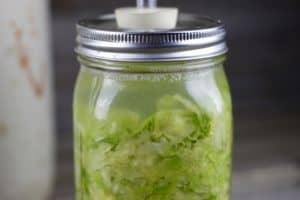 I can’t say for sure if it improves the flavor since there are many factors in fermentation that can improve/change/affect flavor – I’d encourage you to get your hands on an airlock and give it a try and see what you think. I love to hear the outcome! How can sauerkraut increase your stomach pH? It’s acidic (lactic acid), so wouldn’t it *lower* your stomach pH (i.e. make it more acidic)? Hi Marion, my apologies that was obviously a typo. You are correct in that a lower pH is more acidic. Thanks for pointing that out – I’ve updated the post accordingly. When I have made kraut before I when the salted cabbage in exlarge plastic bags and several times a day I would go by and knead it. I did for 10-14 days. Then I put the kraut in jars and heated it enough to seal the lid. Then I put it in my vegetable pantry. It has always tasted good. I don’t have room to put it in the refrigerator. Does heated it destroy and if the probiotics? How much salt do you use? I can’t find my recipe. You are correct in that heating the kraut would kill off the lactobacillus bacteria (i.e. the probiotics). I use the amount of salt called for in the recipe above, increasing or decreasing it depending on how big my batch is. This recipe makes just about 3 cups of kraut once it’s finished so that shouldn’t take up too much room in the fridge and since it only takes about 10-14 days to make you don’t have to make a big batch – it’s easy to make a smaller batch whenever you start to run low. I hope that was helpful. Can you fill the plastic bag with something like maybe rice or beans to weigh the cabbage down? You could… but I wouldn’t recommend it as often times plastic bags aren’t 100% leaf-proof and thus you could risk contaminating your ferment. I’ve since switched from plastic bags with water to these glass fermentation weights and I love them. Hi! Would this sauerkraut be suitable for preserving via waterbath after it ferments? You COULD water bath can this kraut (using either the raw or hot pack method) however, doing so will kill all of the beneficial bacteria that are produced during the fermentation process. 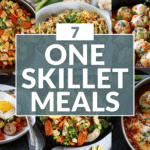 That said if you’re concerned about not being able to use it all before it spoils – consider halving the recipe so you have a smaller amount. I should also mention that it will keep for about 6 months in the fridge so it’s shelf life is pretty long as long as it’s kept cold. 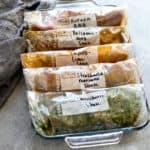 After the process is done, can you put it in freezer bags and freeze it? I suppose you could but I’m guessing that the kruat will be very soft and mushy upon thawing. I think it’s best to make smaller batches more frequently. Can I make this in half gallon jars or smaller jars? I grew a lot of organic cabbage. How about red cabbage? Yes, you can make these in larger jars. 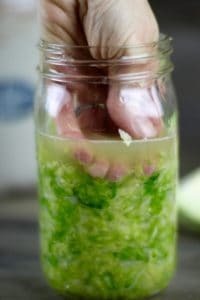 I don’t recommend jars smaller than a quart because your yield will be so low and because there isn’t a lot of cabbage in the smaller jars you’ll have to push it down, or burp, them more often to be sure everything stays under the brine. Note, the larger the batch the longer it will take to ferment so keep an eye on the brine level and be sure to test every other day or so after the first week so as not to let it go too long (or too little). Happy fermenting! I like this recipe; mine is now ready to eat except it is a little too salty for me. Is there anything I can do to make it taste less salty? More vinegar? Sugar? Thanks. Hmmmmm…I would say make the change on your next batch and use less salt. Overtime and with trial and error, you will create your own perfect recipe that suits your liking! No, the jar should not be sealed. You need the gases to be able to escape (because exploding jars of kraut is a nightmare to clean up and the lactic acid bacteria responsible for the fermentation process need oxygen). Just place the lid on top of the jar and give it a quarter turn so that it stays in place but isn’t sealed (i.e. it should leak if you tip it over). Hopefully that clears things up. What. 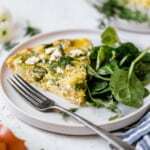 a great recipe!! Unfortunately, my ziplock bag DID leak and I’m guessing 1 tsp of water went down into the brine. Should I start over? Have I contaminated it? Thanks so much! It’ll be fine. One teaspoon of water isn’t likely to dilute the brine enough to ruin the batch. Just keep an eye on it to be sure everything stays under the brine while it ferments and you should be good to go! I noticed the pics show you using what looks like a stainless steel pan. Is it OK to use a metal pan to make kraut? I was told to use either glass or a plastic bowl. Stainless steel bowl is what we use and it works great. Glass would also work. 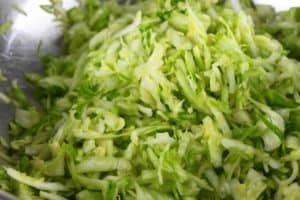 Is there any harm in using pre-cut cabbage from the grocery store, if I wash it well? You could certainly try it, my only reservation is that is would be much drier (since it’s been cut, exposed to air and probably a couple weeks old) so you may not get as much brine as you need for the cabbage to be completely submerged under the liquid. I personally wouldn’t use it but you could give it a try and if you do, I’d love to hear how it turns out and if you had any problems with too little brine, etc. 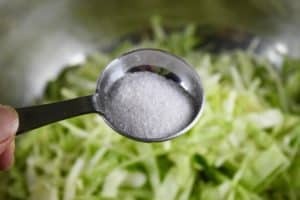 Can i use kosher salt vs sea salt? Also, I hadn’t followed the directions to a T, and I’m noticing that some of the brine leaks into the plate that the jar sits on each day. Is that normal? I would not recommend using kosher salt as it tends to make the kraut too salty. Yes, it is normal for some of the brine to leak out as the active part of fermentation is happening (usually days 2-4). You just want to be sure to keep the kraut packed down so it’s below the brine and that you don’t have any air bubbles forming in the kraut. I just use my clean hand to gently press everything down and ‘burp’ the kraut during this active phase. Thanks for that info. When making my first batch it sat out a week and was under the brine, but I noticed when I transferred it to fresh jars that there was actually very little brine remaining. Once in the new jars the brine doesn’t remotely cover the cabbage. It’s in the fridge, but is it still safe to eat without being packed in brine at this point? Once you’ve moved the kraut to the fridge you don’t need it to be totally covered by the brine. You’re good to go! I add dill, celery seed, caraway seed, garlic, hot peppers, slices of ginger, shredded carrots, and bay leaves. I have heard about people using oak leaves which helps to keep the fermented vegetables crisp, as do the bay leaves. Nothing in the world like fresh homemade sauerkraut. Or other fermented veggies. I was scared at first to do the fermentation. After a couple of batches I realised how easy it was. Always use clean filtered (reverse osmosis) or distilled water and never tap water, any chlorine will kill off the beneficial organisms, even well water can contain crud you don’t want in your sauerkraut. Like extra salts or organisms that aren’t healthy. Thanks for sharing this, Tim! I agree, there’s nothing better than homemade sauerkraut. I have used oak leaves when making fermented dill pickles and they do seem to keep them a little more crisp. I’ve also read that grape leaves will work too, I just use oak leaves because that’s what I have in the backyard. I loved this. It was easy to follow and I am going to use it for life. . THIS is the best comment ever and it makes me sooooo happy! Perhaps homemade sauerkraut isn’t the project for you then. 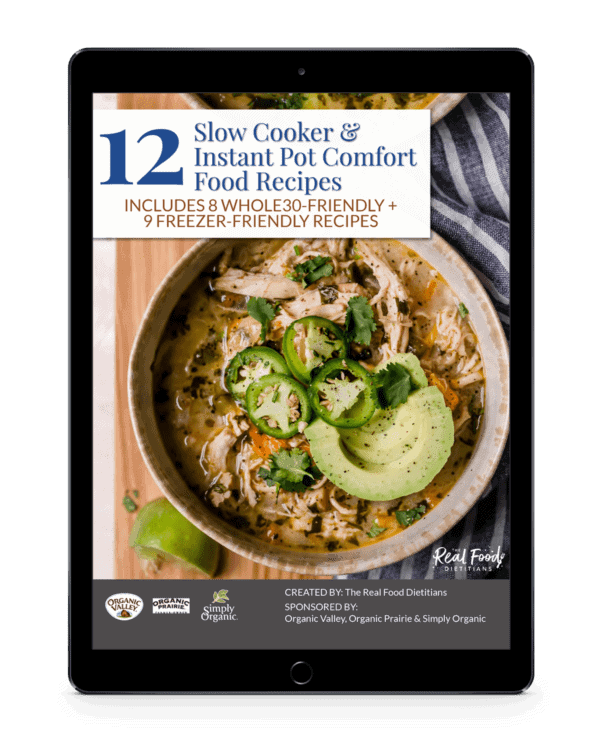 There are many great traditionally fermented krauts out there – including those from Farmhouse Cultures, Wild Brine, and Bubblies – not to mention all of the local ones that may be available in your area. This does sound scary. The brands you mentioned above, Are these just as good as making my own? 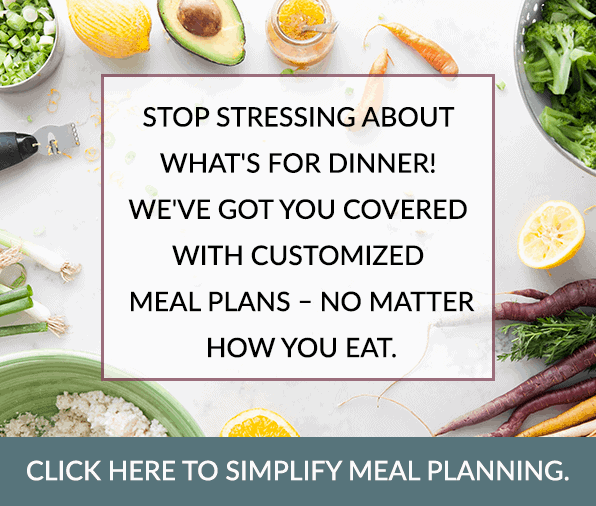 Yes, the commercially fermented brands I mentioned are prepared in the same manner as what you’d do at home only on a much larger scale so they are just as beneficial. I am making this for the first time and I don’t have much brine. I have packed the quart jar so there is three inches headroom, but there is no brine on the top! I had some leftover cabbage and squeezed it well, and added that brine….it just absorbed and nothing is floating on top. I did the 45 minute extra sitting process, as well. Can you tell me what to do now? It sounds like you had a dry cabbage (that sometimes happens, especially in the winter when they’ve been in storage for a while before they hit the grocery store). You can mix up a little extra brine using a ratio of 3/4 teaspoon of salt to 1 cup of water then use that to top off your cabbage. You may have extra brine depending on how much you need to get everything covered. Hi, I am a bit over cautious about this but I just bought a huge red cabbage and I’d love to try making sauerkraut from it. I don’t have any of the fancy airlocks or fermentation weights because truthfully I have never tried sauerkraut so I don’t wanna go spend a bunch of money only to use them once haha. So forgive me for my redundant questions, but is the purpose of the loose lid/cloth on top just to prevent stuff from falling in? Would the cloth or the lid be preferable i.e do I want to reduce airflow but allow gases to escape or is it just a matter of keeping little bugs/dust out of your sauerkraut haha? Thanks for the tutorial though, its great and I am eager to try. Great question and one that it sounds like others have on their minds as well. I fermented for years before buying airlocks and weights because, quite frankly, they just weren’t available back then for non-commercial or home use. The purpose of the loose lid, as you said, is to prevent rogue bacteria and yeast from falling into the fermenting vessel. Though not likely to cause any harm, these bacteria can introduce off flavors and sometimes yeast overgrowth or slimy texture. The other function of a cloth or loose-fitting lid or airlock is just to allow gasses to escape. Lactic acid bacteria, or the type of bacteria that makes lacto-fermentation happen safely, are anaerobic meaning they don’t need oxygen to survive and do their thing. But they are tolerant of oxygen so it’s not imperative that you have an airlock to prevent air (or oxygen) from entering the fermentation vessel or jar. You just need to be sure that all of the cabbage is submerged under the brine at all times as it becomes susceptible to decay by aerobic (oxygen-loving bacteria) when it’s not under the brine. Thanks for the quick reply. Going to get my fermentation started this week. I am excited to see how it goes. Fabulous! Please let us know how it goes. Love your dialogue and ideas! Your Sauerkraut recipe rocks, so does your website instructions. Jessica, if I add pure stevia to my batch, will it impede growth? 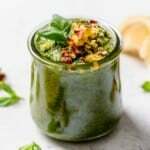 I would wait until after the fermentation process is finished before adding any stevia as it MAY inhibit growth and or change the pH of the product (thus affecting its ability to safely ferment). What happens if I use cabbage that was bought at the store, and set in my fridge for a few weeks. I peeled the otter leaves off. Smelled fine. I used it. I also bought fresh and used it. I’ll be able to compare taste. The fresher is greener. Bubbling the same as the older cabbage. The only difference between the two may be that the older one produces a little less brine because it does lose moisture as it ages. However, it sounds like it’s going well so far. Keep us posted when it’s finished!